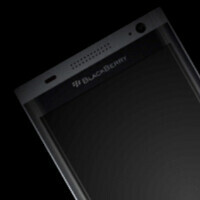 The other day, BlackBerry CEO John Chen mentioned two upcoming BlackBerry models, both to be powered by Android. Unlike the manufacturer's first Android powered device, the BlackBerry Priv, these are expected to be more affordable handsets priced in the $300-$400 range. Today, a combination of photographs and renders have outed the two new phones, code named the BlackBerry Hamburg and BlackBerry Rome. The Rome looks similar in appearance to earlier leaks of a model given the name Vienna. According to sources, it will have a curved AMOLED display with a physical QWERTY and a large speaker that both reside south of the screen. Like the Rome, the BlackBerry Hamburg uses the new BlackBerry logo on top of the device. The power button is on the left of the phone with the volume button on the right. A speaker will be on the bottom of the display. The Hamburg is expected to be priced at $400 and will be launched some time next quarter. Check out the real images and the renders of these two models by clicking on the slideshow below. Either price it competitively or don't bother. And make it universally unlocked. Because I'm making a point. He's means unlocked like the Nexus 5x, 6, and 6p and the 2015 Moto X Pure Edition are. They work on any domestic US carrier, including Verizon. I know this because I am using a Nexus 6p on Verizon. VZWuser76 explained it pretty clearly. Universally unlocked means using it on any carrier. You're not buying it so why would you care? You're just here to once again troll yet another BlackBerry post. You don't even comment on other posts anymore, you just troll BlackBerry. Get a life Michelle. $300-$400 is quite competively priced. But let's wait and see what the rest of the specs are before passing judgement. And why does it have to be universally unlocked? Just because Nexus devices are doesn't mean BlackBerry has to do it. Samsung doesn't. Apple doesn't. The list goes on. Actually, IIRC the iPhone is unlocked. So it the PRIV. But Mxyzptrick doesn't know that. It should have been. It would have been a little competitive but not as good as the Moto X Pure. You forgot to add the "IMO" at the end of your sentence. I fixed it for you. No need to thank me. I never said otherwise, so of course it was my opinion. You are the one who needs to learn what IMO means. No, you are. That's why I corrected you. Now just say "thank you" and be done with it. I'm not wrong about anything. Stop trying to pick fights. You're definitely wrong. That's why I corrected you. And considering that you've been picking fights with me across several articles, you have no leg to stand on here. Chen already said the next two handsets will be priced between $300-$400. And they don't need to make it universally unlocked, as GSM unlocked handsets sells far more than universally unlocked ones. Besides, if the largest smartphone vendor by volume (Samsung) isn't concerned with universally unlocked, as well as HTC, LG, Sony, why should BlackBerry be? There main market (enterprise) isn't concerned with universally unlocked either. Because then it can be used on any carrier. Why limit choices? The iphone is unlocked, so it is becoming a standard. But it isn't a standard. GSM unlocked is. And that's not going to change anytime soon. And why are chooses limited when there is sure to be CDMA variants made? BlackBerry always has both GSM and CDMA variants. The problem with having separate CDMA and GSM variants is your locked to a carrier then. With my 6p, I can take it from Verizon to Sprint, T-Mobile, or AT&T and not worry about functionality. My previous device, a Droid Turbo, had bands for AT&T and T-Mobile, but it wouldn't have had full functionality, like no LTE or no voice depending on location. So that means selling your current device and buying another one, maybe even the same phone but in a different variant. To me that makes less sense. And considering there are devices going for $400 that are unlocked domestically, price shouldn't be an issue. I'm fully aware what universally unlocked phones can do. One can always get a GSM unlocked phone and not have to be locked to any carrier if they use GSM phones, which is the world-wide standard. You won't lose any functionality with a GSM unlocked phone that's penta-band. More and more GSM unlocked phones are like this. And my PRIV is an AT&T branded one that's unlocked, and I get full service on T-Mobile's network with it, LTE and all. However, none of that disproves that GSM unlocked is the standard worldwide, and outsells universally unlocked by a wide margin. The average consumer just doesn't care, or isn't aware. That's only a real concern for geeks and nerds, and those that frequent cellphone sites like this one. You're quite correct, but that still doesn't help people on CDMA carriers in the US, or people wanting to switch to them. And just because the average consumer doesn't know or care about it doesn't mean we should just leave it at that. Ten years ago the average consumer didn't know or care about smartphones either. I don't see why you see this as a bad thing. GSM may be the majority standard in the world, but until there is a single worldwide standard, why not at least make it easier to switch between carriers? Going the route that last year's Moto X and Nexus devices means only having to produce 2 models. Where otherwise just in the US there might be 5-6 variants. What makes you think I see this as a bad thing? I haven't said one negative thing about universally unlocked phones. Here or anywhere else. All I have done is point out the merits of GSM unlocked phones, and point out the facts concerning them. What's wrong with that? I also never said or implied that we should leave anything "at that". If universally unlocked phones becomes the standard down the line, so be it. It's just not the standard now, and probably never will be. As long as I can get the smartphone of my choosing unlocked (as is my preference), I'm good. Because there would only be one variant of the universally unlocked model. We all know how the CDMA Sprint version of the Priv went, it never came out. It only came out on Verizon. But there are several CDMA versions of the PRIV in other parts of the world, and NO, you not caring about the rest of the world doesn't change this from being a fact. Not always. The Passport never came to Verizon or Sprint. Very true. But Verizon and Sprint never intended to carry the Passport, either. It was too unorthodox for them. But other BB10 handsets (Z10, Q10, Z30, Classic) had CDMA variants.